“Union Market, northeast D.C.’s vibrant retail and culinary district, invites local families, friends and ice cream fans out for the sixth annual DC Scoop event on Sunday, July 17 from 1 to 4pm. 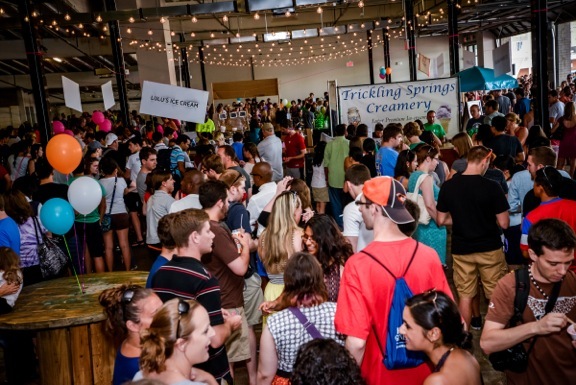 The highly-anticipated, free ice cream extravaganza will take place at Dock 5, the indoor space above the Market, where ice cream vendors from 11 different creameries will put their best foot forward to win the coveted “Best Ice Cream” title. DC Scoop guests will enjoy a wide array of free samples and servings for purchase, including gelato, ice cream sandwiches, popsicles and soda shoppe-style scoops. Frozen treat fanatics at the family-friendly event can also participate in ice cream-eating contests, raffles and giveaways. Timber Pizza Co. will provide savory complements to patrons’ favorite desserts, while Union Market vendor Buffalo & Bergen will join the fun to serve Root Beer Floats to kids.